Starz has just released a new trailer for the upcoming season of American Gods while also confirming that it will premiere on March 10, Variety reports. The trailer features even more scenes of the ancient gods and the new ones, with Mr. Wednesday (played by Ian McShane) providing some eerie narration. Sarah McLachlan’s “Dear God” plays in the background as the newer gods and modern scenes are introduced. Mr. Wednesday tells Shadow Moon (played by Ricky Whittle) that the latter will have an important role to play in the war to come. But the rest of the trailer shows other characters such as Laura (played by Emily Browning) and Mad Sweeney (played by Pablo Schreiber) warning Shadow against the suspicious schemes of Mr. Wednesday. Another trailer was released late last year during the show’s first appearance at the New York Comic Con. Brian Fuller stepped down as showrunner after the first season but Jesse Alexander (Hannibal, Star Trek: Discovery) will take over while author and executive producer, Neil Gaiman, will continue to play a central role on the show. 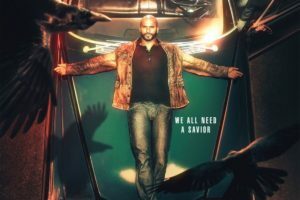 American Gods season two begins on March 10 on Starz.